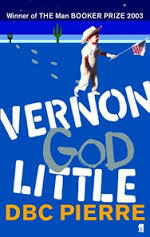 It’s not the first time I’ve quoted Vernon God Little, and since I’m only part way in ( and being a fan of DBC Pierre I’ve also quoted from Lights out in Wonderland ) I don’t think this will be the last time you see me quoting from this book. He really does have a way with words to be envious of. I’ll say good luck, Julie … Enjoyed your Vernon excerpts. DBC is certainly a character. Oops, meant to add that I loved hoe he got Vernon’s voice, as you show here. Thank you Sue! Yes he really does get the voice. It’s a real treat to read. I’d love to see him speak one day. Dream on!